Humboldt State University’s Class of 2017 takes the stage in Redwood Bowl for three commencement ceremonies on Saturday, May 13. More than 2,300 students have earned credentials and degrees in the 2016-17 academic year, and more than 1,750 are signed up to participate in the ceremonies. More than 15,000 guests are expected to attend. The event will be streamed live online, which viewers will be able to access from a link on the University homepage at www.humboldt.edu. In addition, alternate live-stream viewing will be available to visitors in the Van Duzer Theatre. Due to limited seating, spots are available on a first come, first served basis. A video recording will be available online right after the ceremony, and can be downloaded for free from commencement.humboldt.edu in the weeks following. Redwood Bowl hosted its first commencement ceremonies in 1966 when growing enrollment prompted a move from the courtyard of Founders Hall. Humboldt State’s first graduation event took place at Arcata’s Minor Theatre in May 1915, with 15 women receiving teaching certificates. Cheyenne King, a senior in Psychology and Liberal Studies Child Development, will be recognized during the event as one of Humboldt State’s Outstanding Students of the Year. King has put in over 700 volunteer hours with a variety of organizations, and is known for her academic excellence, deep commitment to the campus community, and social justice activism. Abigail Petersen, a senior in Biology, will also be recognized as an Outstanding Student of the Year. Dedicated to studying medicine, Petersen has participated in two research projects, including the North Coast Concussion Program, and was named the first Moonstone Crossing Cancer Research Scholar. CSU Trustee J. Lawrence Norton will be visiting campus and will give remarks at the ceremonies. Forever Humboldt: New graduates are encouraged to register for FREE with Forever Humboldt, the official association for the HSU community. Stop by the Humboldt Alumni tent, located near the scoreboard in Redwood Bowl. Registered alumni members receive ongoing HSU Library access, special discounts at local businesses, access to HSU career resources, special invites to Forever Humboldt events, and more. Get more information about Forever Humboldt at forever.humboldt.edu. 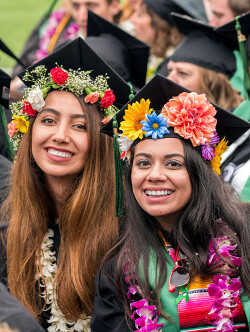 Get Social #HumboldtState: Graduates, their friends, and families are again encouraged to share their photos on social media by tagging them with #HumboldtState. HSU’s website and social media accounts will feature photos from students and audience members. Shortly after the last event ends, you will be able to view and download graduation photos from HSU’s Flickr photostream. Graduation Pledge: Students are encouraged to take the Graduation Pledge of Social and Environmental Responsibility, a Commencement tradition that began at HSU in 1987 and has been used by more than 100 universities worldwide. Graduates can stop by the table in the West Gym to take the pledge and pick up their pledge ribbon. Greening Up Graduation: Students are once again helping HSU reduce waste at Commencement. Purchased caps and gowns can be donated to the Campus Center for Appropriate Technology for re-use (graduates can keep the cap, tassel, and stole). Collection bins are located near the tunnel entrance to Redwood Bowl. Students will reduce the number of single-use bottles and have water stations throughout Redwood Bowl. Compostable water and coffee cups will be available, and discounted water canteens will be available for purchase. Thanks to student groups Campus Center for Appropriate Technology, HSU Takes Back the Tap, Redwood Chapter of Environmental Educators & Interpreters, and Waste Reduction & Resource Awareness Program. Receptions: Academic departments will host receptions at various locations, which will be listed in the back of the free Commencement program. The program will include a campus map. More information about receptions is available here. For maps, parking, and more details on Commencement, go to commencement.humboldt.edu.